So my daughter asked me why I was collecting pictures of people's feet on our computer. "Ew, gross" is actually how she began her posed question. Ah, my dear, dear girl- you have so much to learn! It's not the feet I'm interested in, of course. It's the shoes- shoes, shoes, glorious shoes! Of all the ways you can accessorize an outfit, shoes are - in my opinion at least- the most important element. In fact, they quite often make the outfit. Yes, yes jewlery is important, I guess... but I've never been a bling girl. Shoes are just so much more fun! 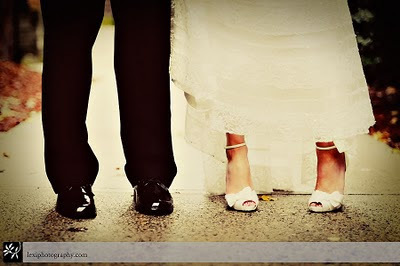 Lately I've been seeing lots of color in wedding shoes. 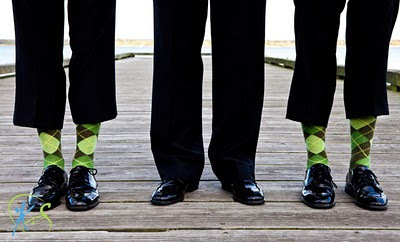 What a great way to express yourself and define your personal style on your wedding day. 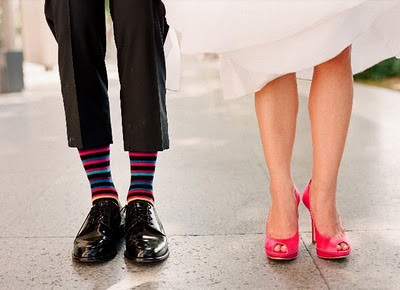 That little glimpse of shoe as you march down the aisle helps tell your story.. fun, flirty, style-maven, beach bum, sophisticate. Whatever it may be, it's all you! The guys can have fun too... thanks Kristin Spencer! This is a photo by Lexi Photography. Lexi happens to be one of my favorite photographers because she always captures all the little details that make a wedding special and unique. I love the bows on these shoes!